Halloween Gift Set with Kitty Bee Designs! Howdy Friends! I've got some exciting news to share with you today! 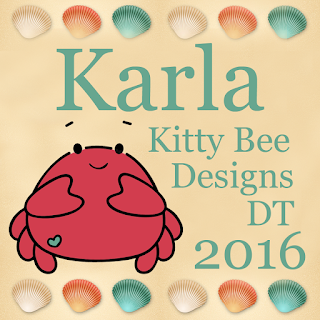 I'm a new Design Team Member over at the Kitty Bee Designs blog!! For my first project, I decided to use the adorable Halloween Mr. Bitty digital stamp to create a card and treat box holder gift set! For the card I used an orange cardbase and inked the edges with Black Soot Distress Ink before layering on some Jillibean Soup papers, a pretty doily and some awesome sequins from SpiegelMom Scraps. I coloured the cute bat and pumpkin digi image with Prismacolor and Hobby Colour Markers and popped it up with foam dots to give him some dimension. I found some awesome black ribbon in my stash and tied it around the border. The Happy Halloween sentiment comes with the image and I cut it apart to add it under my ribbon. These cute tags were included in a Jillibean Soup paper ephemera pack and coordinate with the 6x6 paper pack. I added more Distress Ink and layered on some diamond sequins with a brad in the center - I think it totally looks like a bat ;) and a paper star and wooden bird with glitter. 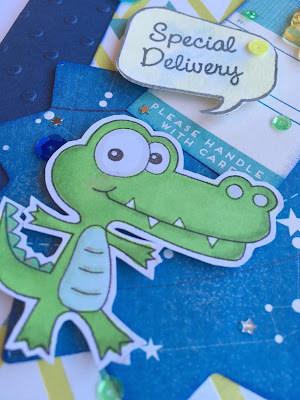 For the treat box I followed along with a video from Chic'n Scratch on YouTube where she shows you exactly how to cut and score your cardstock to create this cute little box! I layered on another one of the Halloween Mr. Bitty stamps, printed smaller - one of the awesome things about digi stamps!! and cut it with a Spellbinders die and my Cuttlebug. I filled the little glassine bags from SpiegelMom Scraps with candies and attached a Jillibean Soup label from that 6x6 paper pack and some washi tape. These cute little bags are food safe, and adorable ;) - and you can see them close up along with the sequins I've used in my YouTube video here on my New YouTube channel! I added more of that awesome ribbon and a little spider web from the ephemera pack. Here's one more look at this cute gift set! I love how it turned out and I'm so excited that I'll be bringing you more Kitty Bee Designs goodies in the future! You can check out the Kitty Bee Designs blog here, the Etsy shop here, and the Kitty Bee Designs Aloha Friday Challenge blog here where you'll find tons of amazing inspiration and a chance to link up your own projects! Thanks so much for stopping by, and have an awesome week! Say Cheese Lawn Fawn Mice! Howdy, and happy Tuesday! Hope your week is going great so far. 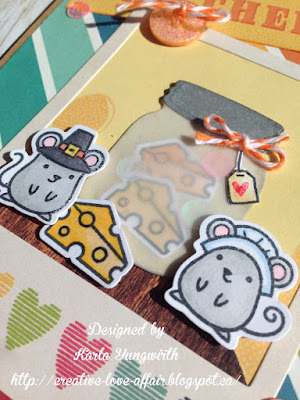 I've had a lot of crafty stuff going on lately, and I just had to come back again today to share these sweet Lawn Fawn Thankful Mice! They are so cute, and perfect for this Thanksgiving card. I had a piece of background paper in a Smash book that had the Say Cheese sentiment on it, so I cut it into a banner shape and added it to my card, layering the swiss cheese image from the same paper behind my Simple Stories Polaroid cut out. I layered the mason jar and adorable mice onto the photo, using some popdots for dimension. A pretty piece of striped Simple Stories paper was just right for the base of my card. 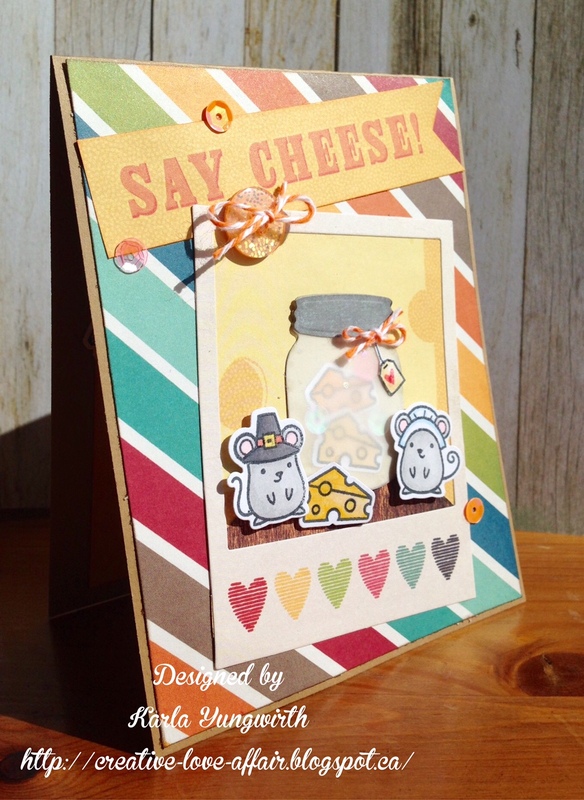 I cut the mason jar from velum using a metal die and my Cuttlebug and added some of the yummy cheese inside. I used a little tea bag tag from the Love You A Latte set and a tiny heart to the top of my jar. 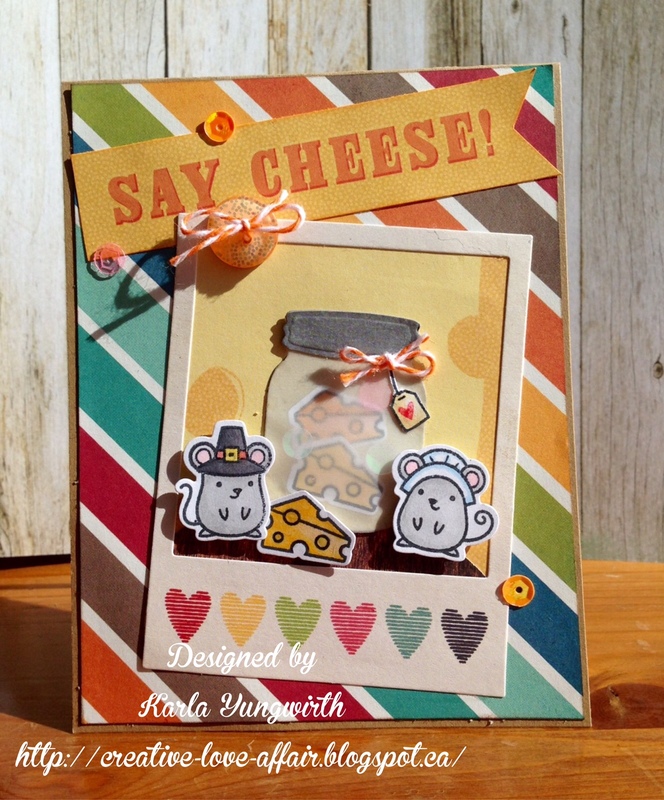 Inside, I used the sentiment included with the set and another piece of cheese along with that cute heart stamp again. A few sequins and buttons from the 28 Lilac Lane collection finish off my card! Thanks so much for stopping by today! Be sure to come back tomorrow for some exciting news and a fun project! Create a project that features a fantasy subject. The winner will recieve $10 gift certificate! And we are giving away a $25 Amazon gift certificate, courtesy FCCB DT! 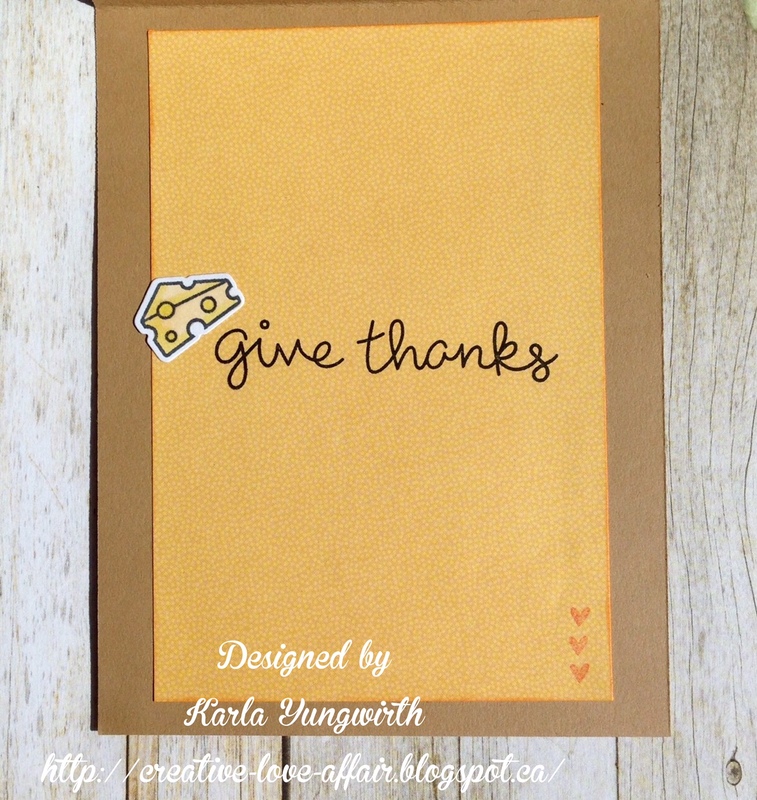 For my project I've used the Cricut CTMH Artistry and Stretch Your Imagination cartridges to create this sweet fall card, along with an adorable image from our sponsor, Aurora Wings - Happy Thanksgiving! I cut this lovely fall wreath from the Artistry cartridge and used some Distress Inks to sponge on some colour before layering it over the image that I coloured with Prismacolor and Hobby Colour Markers - both alcohol based. I added some shiny Stickles for glittery fun! I stamped an image from the Thanksgiving Eats stamp set from Pretty Cute Stamps on a banner and then layered it over a second banner, adding some Distress Inks around the edges. The acorn border is from the Stretch Your Imagination cartridge and it really has a lot of awesome images! I used some pretty fall paper from CTMH that has been in my stash for a while, just waiting for the perfect occasion. Inside, I stamped my Thanksgiving greeting and added one of the cut outs from the acorns on the front of the card. The back of the green paper was different, so I was able to turn the acorn 'hat' around for a different pattern. I really love how this cute card turned out - and I love the little sprite image wearing the turkey costume! Be sure to head over to the Fantabulous Cricut Challenge Blog to see what all the other Design Team members have come up with and enter your own project with a Cricut cut for a chance to win an awesome prize! Also, if you haven't seen my last blog post - I have a NEW YouTube channel - and would love for you to follow me there!! Baby Cards and a Video!! Happy Monday friends! I'm really excited about my new YouTube Channel, and I've created two baby cards today using Pretty Cute Stamps, along with a video to go along with them! I haven't had any baby cards to make for a long time, and I needed two recently. My hairdresser is having a baby boy, and my youngest sister is having a baby girl - yay!! Such exciting times, and I had some great ideas for combining digital and clear stamps to create these cute cards that I wanted to try out. 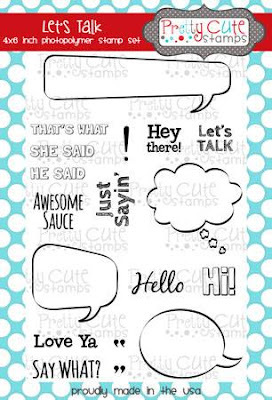 I first used the Special Delivery sentiment from the Pen Pals stamp set inside word bubbles from the Let's Talk stamp set and stamped on watercolour paper. I used my Tim Holtz Distress Crayons to watercolour my bubbles by scribbling on my craft sheet and then using a paintbrush to dab on the colour mixed with a bit of water. For the boy card I used blue and green, and then for the girl card I used a red and pink crayon. 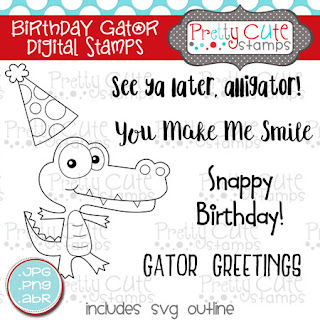 I coloured the adorable gator from the Birthday Gator digital stamp set with Prismacolour and Hobby Colour markers, both alcohol based and layered him over some of the awesome papers from the Shimelle StarShine Collection. I found this sweet little soother button in my stash and added it to my tag along with some shiny metallic thread. A bit of Distress Ink around the edges adds some colour. I used a Spellbinders die to cut the star shaped diecut background and added some pretty sequins from SpiegelMom Scraps. 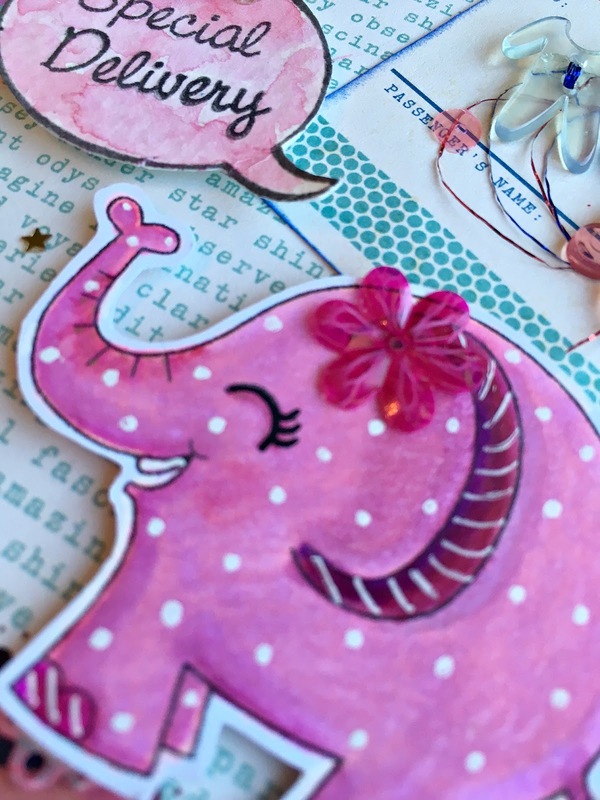 For my second baby card I used the super sweet elephant from the Birthday Elephant digital stamp set and coloured her pink and then used some white gel pen to add some pretty details. 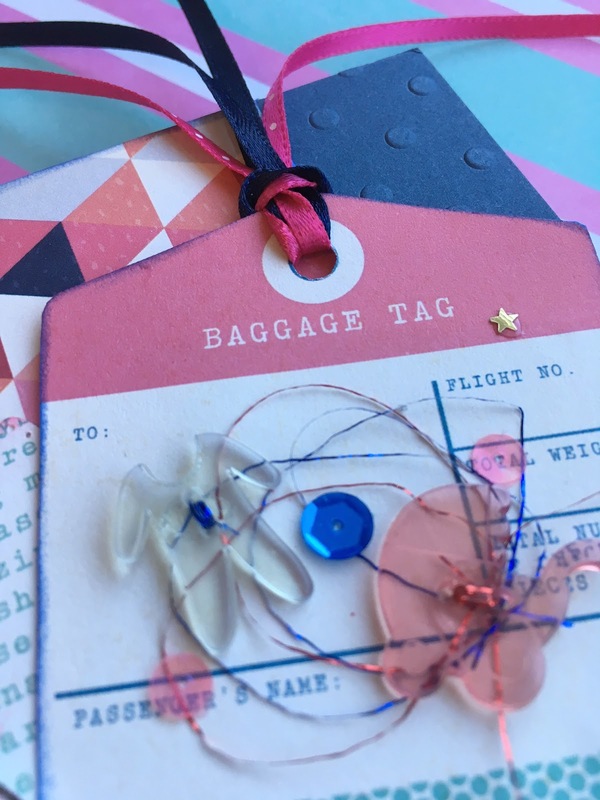 I used some more of those cute buttons and layered them on some twisted metallic thread in blue and red to match my card. I love the colours in this StarShine collection! More pretty sequins decorate my card - love this flower sequin!! 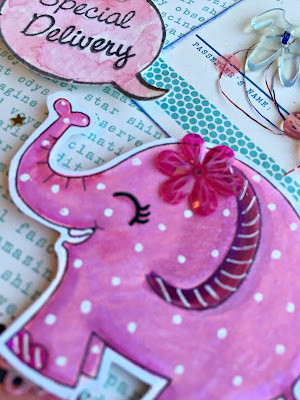 There are so many cards I could use this elephant on - and she'd look good in any colour! Thank you so much for stopping by! 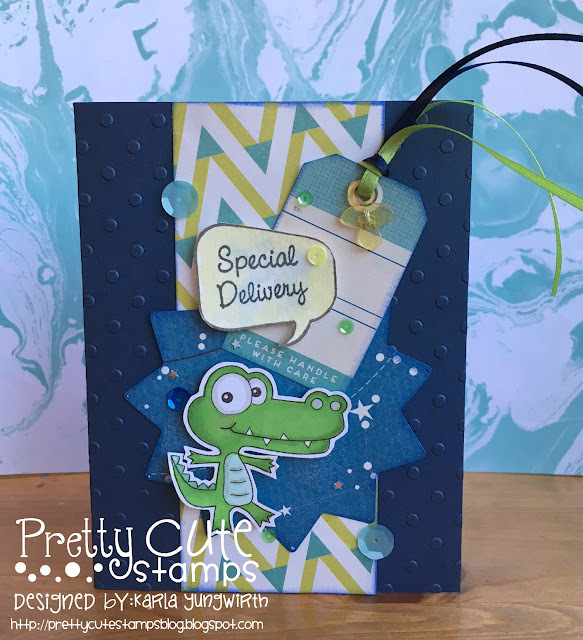 Don't forget to check out this month's New Releases from Pretty Cute Stamps and the current challenge using Polka Dots!! Have a very happy, very crafty week! New YouTube Channel and SpiegelMom Scraps Haul! Hi crafty friends!! Well, I finally took the leap - I made a crafty video on my brand new YouTube channel! I used iMovie to create my video and uploaded it directly from my iPhone - actually easier than I thought. Of course, I can already see some areas that need tweaking, but it's a step and I'm so happy and a bit nervous! You can check out my video here - I'd love for you to LIKE it and SUBSCRIBE! Pretty Cute Stamps September New Release Blog Hop! 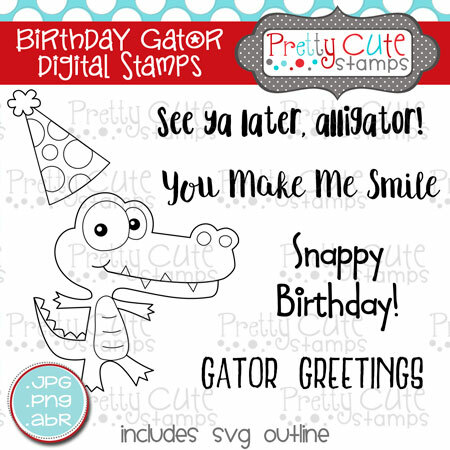 Thanks so much for joining us for the September 2016 Digital Stamp Release Blog Hop, where we are all sharing projects featuring the new digital stamps this month that are now available in the Pretty Cute Stamps Store. 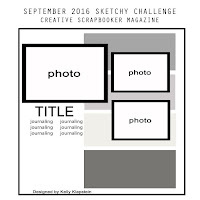 If you came from Kel's blog - Scraps & PhotoGRAFFS, you are in the right place. 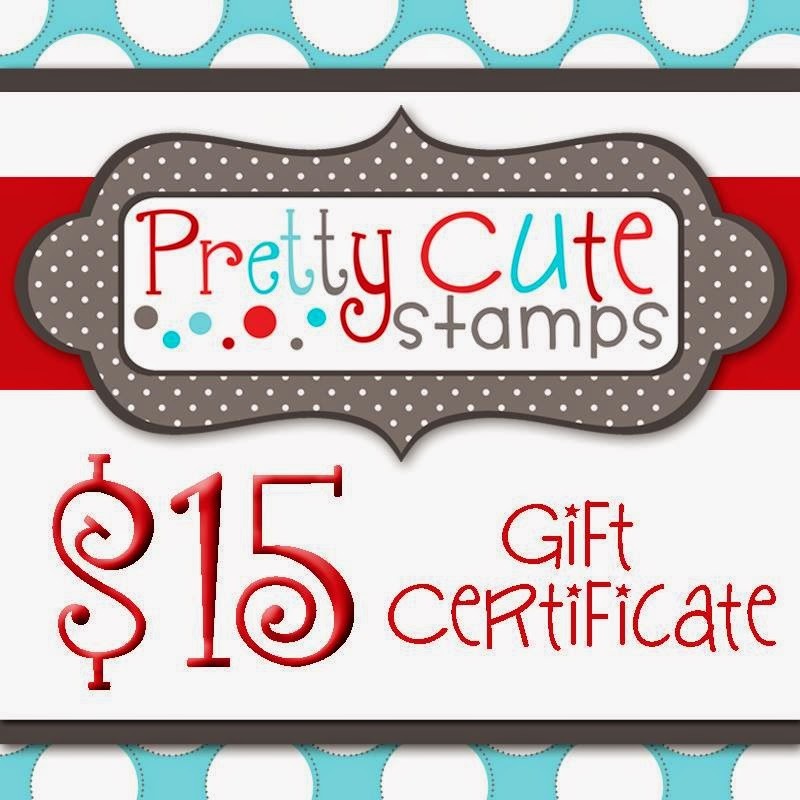 If you just stumbled across this post and would like to start from the beginning, please visit the Pretty Cute Stamps Blog. 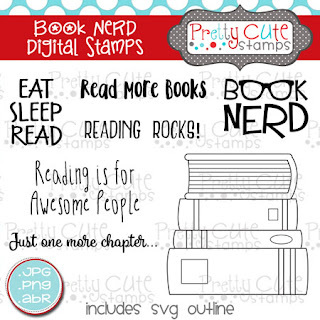 I printed this sentiment from the Book Nerd digital stamp set directly onto my piece of pink patterned paper before layering on the digital book image, which I printed on white cardstock and coloured with Prismacolor Markers. I love being able to size the digi stamps however I want to fit the project I'm working on! Another awesome thing about these digital sets is that they come with the PNG files as well as JPEG files! This means I was easily able to upload the PNG version of the Book Nerd sentiment into Cricut Design Space and use it as a cut file with my Cricut Explore. I added MY using some Pink Paislee Thickers, and printed my journaling onto copy paper before cutting it and gluing it onto my page. I usually just handwrite my journaling, but I was quite happy with how this turned out! I printed some of the other awesome sentiments included in the Book Nerd set on white cardstock and then used Distress Ink to add a coordinating colour to match my page. I used the 123 WR Memory Keepers punch board to punch the edges to resemble a tab and then layered them on another piece of patterned paper. The sequins from Spiegelmom Scraps were perfect to add as embellishments to my page! I've really been loving using my sewing machine on layouts, and after I put down the pretty papers on the left I stitched around them. I cut this scripty sentiment into a banner and layered it over my photo - so perfect! 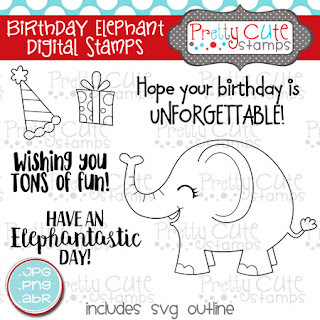 Here's a look at this awesome digital stamp set! A random winner will be chosen on Monday, September 26, 2016. 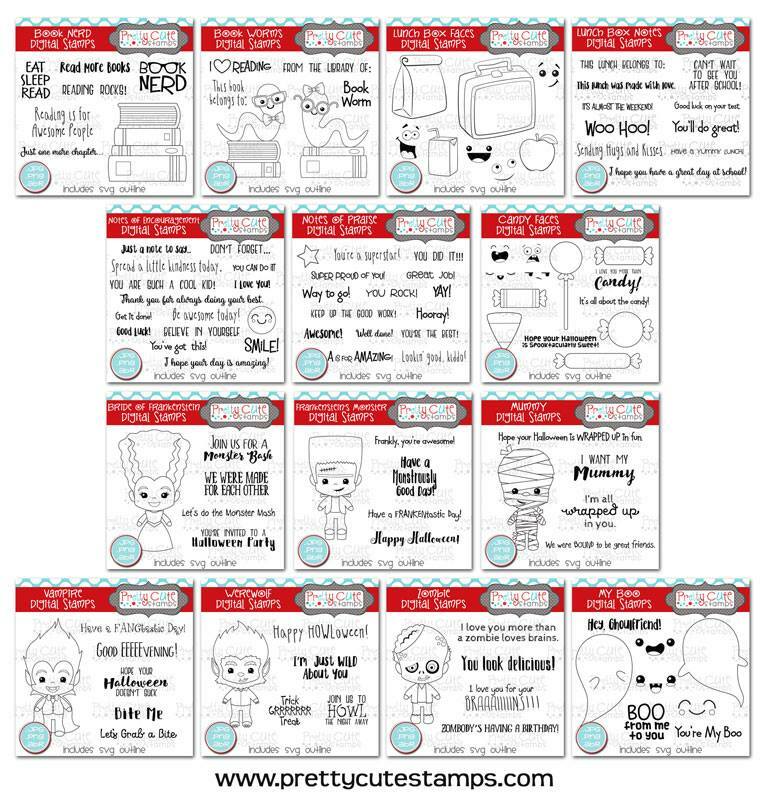 Here's a look at all the September 2016 New Release Digital Stamp Sets! Aren't they AMAZING?!! There is also a FREEBIE digital stamp available for you today only at the Pretty Cute Stamps blog! Now, you can head over to the next stop on the hop- Tasha at Crafty Pink Pixie! 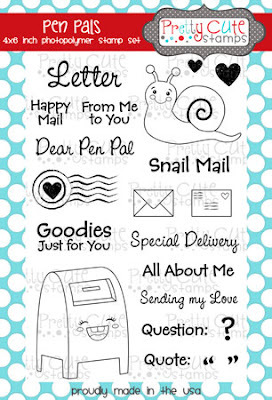 Karla: http://creative-love-affair.blogspot.ca/ YOU ARE HERE! Thanks so much for joining me today! Don't forget to leave your comment for a chance to win :) and have a FANTASTIC day! 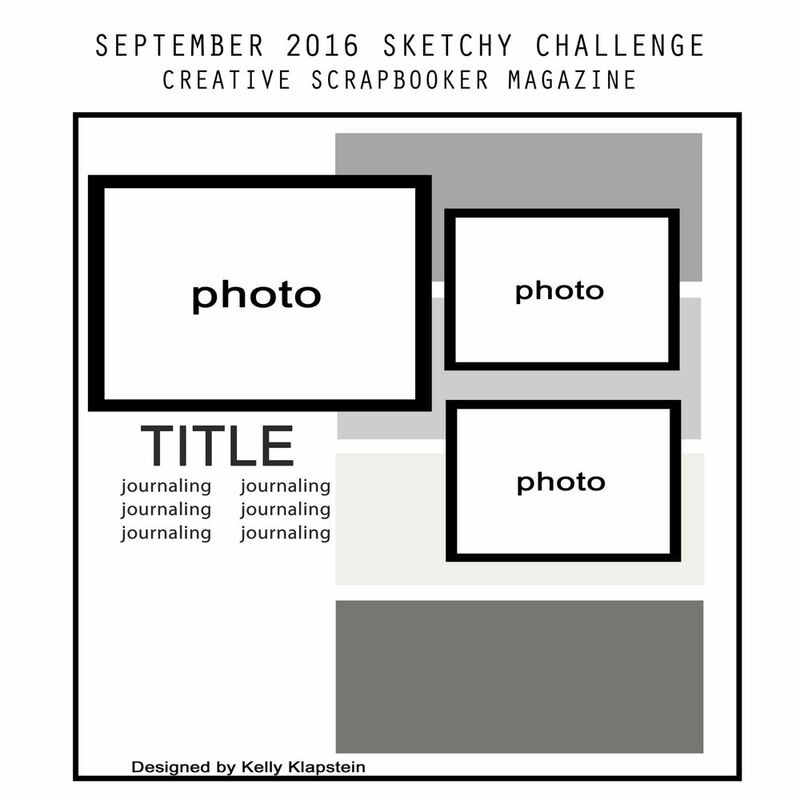 I have another flip book to share with you today! These are just so fun to make when you want to play with different supplies and techniques. This is a book I swapped with a sweet girl, Allison - you can find her IG here with links to her YouTube channel - and she sent me the cutest flip book too! I used Project Life cards as my base and attached them with washi tape. I embossed this awesome sentiment from the Pink and Main Believe Script stamp set with gold embossing powder, and used some pretty pink crinkly ribbon to tie the outside. I love adding my recipients name on the front to personalize it even more! Here's a look at all the pages I included. I added stickers, paper ephemera, handmade tags, 3x4 journaling cards as smaller flaps, stamps, doilies and sequins, along with some goodies for Ally to use! Thanks so much for stopping by today! I hope you found some inspiration to create something fun for yourself or a friend. 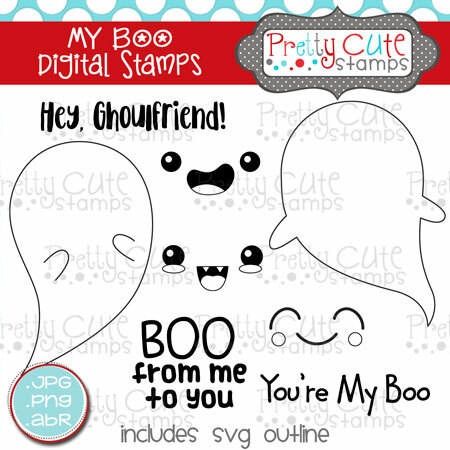 Don't forget to check out my post from YESTERDAY where I show you a sneak peek of the Pretty Cute Stamps September New Release digital stamp sets and a FREEBIE digi stamp!! and be sure to check back TOMORROW for the New Release Blog Hop where you'll get to see my project and all the new releases available!! 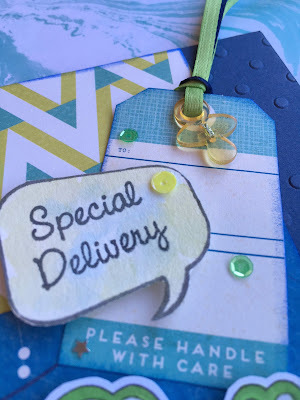 SSS Work It Wednesday August - Stamp It! Aspen Beach Pocket Page Scrapbook Layout! Sequin Saturday Blog Hop with SpiegelMom Scraps!